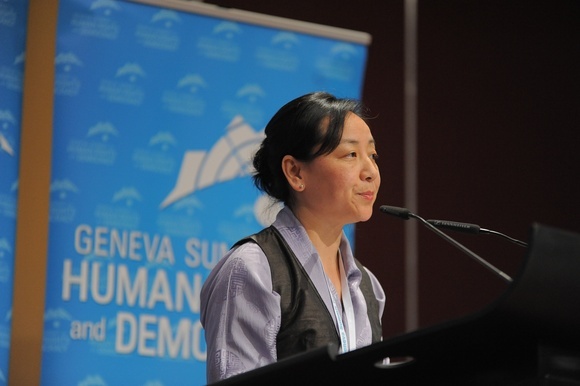 In the run up to the 22nd session of the United Nations Human Rights Council, Kalon Dicki Chhoyang addressed the issue of Sino-Tibetan relations at the 5th Geneva Summit for Human Rights and Democracy on 19 February. This annual event gathers hundreds of dissidents, human rights victims and activists to bring urgent human rights situations to the attention of the international community. Dicki Chhoyang was born in India in 1966 and grew up in Montreal, Canada. She began working for the Tibetan community at a young age through various development projects. Between 1994 and 2003, she studied in Beijing and lived in Tibet where she learned the local Tibetan dialect and conducted field research on Tibetan-medium higher education. She then worked for a private American philanthropic foundation that funded community development projects in Tibetans areas of the Qinghai and Gansu of China. In 2011, Chhoyang was appointed head of the Department of Information and International Relations for the Central Tibetan Administration based in Dharamsala, India. Since 2009, over a hundred Tibetans have self-immolated in protests against Chinese rule. The self-immolations began with monks and now include teenagers, women, middle-aged parents and nomads. Tibet has been under Chinese rule since 1951, why this outbreak now? I think there is a sense of urgency about the gravity of the situation. Eighty-six of the self-immolators have passed away since 2009. This is a clear signal from Tibetans against the repressive policies of the Chinese government in Tibet. We are losing our language, our way of life and the environment is being destroyed. It is not a new phenomenon, but the form of protest we are seeing now is a consequence of the fact that Tibetans inside Tibet have no other conventional space for protest. They tried demonstration and petition, but when you live in a police state you are silenced within a matter of minutes and never heard. Also, a lot of the self-immolators were born and raised after the Chinese occupation and have their own view as to how they want to react to China's occupation of Tibet. Policies imposed on Tibetans are characterized by cultural assimilation, with Tibetan monasteries run by the Chinese Communist Party and the language of instruction being changed from Tibetan to Chinese. Environmental policies include a lot of mining operations and dam building without consultation with local communities and the benefits going to the Chinese government. A direct consequence of this is the forced settlement of Tibetan nomads who are being settled into simple brick houses and forced to sell their livestock and to abandon a way of life they have known for generations without planning as to how they will cope with livelihood issues once they run out of the few thousand Renminbi they have been giving when settled by the government. Thirdly, there is the economic marginalization of Tibetans with an influx of Chinese migrant workers and increasing unemployment of young Tibetans in urban areas. These are some of the causes behind the self-immolations. Do you see a significant difference between the administration of western and central Tibet (Tibet Autonomous Region) and that of eastern areas, which are mostly incorporated into the neighbouring Chinese provinces of Sichuan and Qinghai? Even in the so-called Tibet Autonomous Region, Tibetans do not have much more autonomy than in the east because the decisions are made in Beijing and executed locally. Each province in China is governed according to a parallel system. There is an administrative system with governor and vice-governor, and a party-system with party secretary and deputy-secretary of the communist party. The power belongs to the party structure. So even if a governor in western Tibet is Tibetan, the power lies with the party secretary who will always be a Chinese person. Considering China's refusal to engage in open dialogue on the situation in Tibet, do you think the international community's perception of the political reality in this region is accurate? What is important for the international community to know is that China keeps saying everything is fine in Tibet and people who are self-immolating are being incited by the Dalai clique and the diaspora. Well, if everything is fine in Tibet then why aren't they letting anybody in? The United Nations (UN), the media and foreign envoys are being denied entry. The Chinese have developed infrastructure in both urban and rural Tibetan areas. Sure, they developed the infrastructure in cities, but to whose benefit? If after all these improvements, Tibetans still feel compelled to protest against Chinese policies, it means something in these policies is misguided. What people see when they go to Tibet is a facade. The monasteries have no control over the curriculum for monks and nuns, historians cannot research any topic they want, and now they cannot even teach in Tibetan. But China wants to maintain appearances. It is internationally unprecedented to have self-immolations on that scale as a form of political protest, and it certainly is unprecedented in Tibetan history. We have seen it in Vietnam, Tunisia, China but nowhere on the scale we are witnessing in Tibet. Right from when the immolations began, the Central Tibetan Administration* appealed to Tibetans inside Tibet not to resort to drastic measures, including self-immolation. Despite our appeals, the self-immolations have persisted. So as an administration, we feel a duty to speak up on their behalf and explain to the international community the reasons behind the self-immolations. We also have been making great efforts to appeal to the Chinese government not to respond to protests with greater repression but to listen to Tibetans. None of these people, including the administration that I represent, is challenging China's political and territorial integrity. We are not asking for independence. We are willing to remain a part of China provided we are given genuine autonomy on matters such as education, culture and religion. Is the UN taking appropriate action with regard to the situation in Tibet? We have seen some reactions. In November last year, UN High Commissioner for Human Rights, Navi Pillay, issued a very strong statement regarding the situation inside Tibet and foreign affairs ministries have also issued statements of concern. But it is clear that more needs to be done. I think Tibet is a very strong test of people's principles when it comes to supporting non-violence and encouraging peaceful conflict resolution, because Tibetans are faced with formidable force in China. We talk a lot about principles of non-violence and peace. These principles have to be upheld not when it is convenient, but particularly when it is inconvenient. In the context of the UN, we are asking to have China held accountable as a member of the UN and the Human Rights Council - to uphold the commitments it has made. There are 12 outstanding human rights related requests by special rapporteurs to visit China. In 2004, China agreed to have the special rapporteur on freedom of religion visit Tibet and the visit has yet to take place. China's strategy is to turn a deaf ear to whatever the international community says about Tibet, claiming Tibet is China's internal matter. But pressure has to be sustained because I do believe China pays attention to public opinion and it can make a difference. How do you think the situation will evolve in Tibet? We see the interest for Tibetans to be part of China, and of course China wants Tibet to remain in China. Tibet is very strategically located and has huge amounts of natural resources. It is the origin of ten of Asia's major rivers and has various types of minerals. The last round of talks took place in 2010 and there has not been any contact since then. For us, substance is primary and we want to engage in dialogue. So if China wants envoys of the Dalai Lama, we will send them. Whenever they want to meet, we are ready to resume dialogue without pre-conditions. As we speak, there are some misconceptions that the Chinese government is trying to perpetuate when it comes to the issue of Tibet. One is that we are seeking independence. Of course, there are two schools of thought within the Tibetan community, one is for independence and the other is for autonomy. I represent the legitimate, democratically elected leadership of the Tibetan community and our position is autonomy – just like the Dalai Lama's. But we let the people who believe in independence speak because they have the right to express their views. Secondly, it is often believed in Europe that Tibet is still a theocracy, which is not the case. The Dalai Lama devolved his political authority to the elected leadership in 2011. During the last round of talks, at the request of the Chinese government, we submitted a document presenting our vision of autonomy. So we put it in writing in a document called Memorandum on Genuine Autonomy – also known as the Middle Way Policy – where we seek a middle-ground between complete independence and the status quo. Currently, the decision making power is centralized in Beijing, but if we look at places such as Hong Kong we see it is possible to have one country with two systems. So we believe that if there is a political will, common ground can be found. *The Central Tibetan Administration (CTA), commonly referred to as the Tibetan Government in Exile, is based in Dharamshala, India and was established by the 14th Dalai Lama in 1959 shortly after his exile from Tibet. While its internal structure is government-like, it has stated that it is “not designed to take power in Tibet” but aims to restore freedom for Tibetans inside Tibet. The CTA's policy does not seek independence for Tibet, but proposes that Tibetan regions remain an integral part of China provided they are granted genuine autonomy.